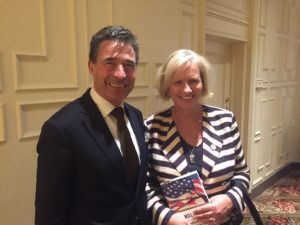 Martensen Wright PC, a Premium Sponsor of the Danish American Chamber of Commerce of Northern California was proud to be a part of the presentation by, and welcome dinner for, the former Prime Minister of Denmark and former NATO Secretary General, Mr. Anders Fogh Rasmussen. Mr. Rasmussen was promoting his new book, “The Will to Lead”. The evening at Mark Hopkins Hotel in San Francisco started with a fireside chat, where Mr. Fogh Rasmussen presented his views on American leadership in the global struggle for freedom and democracy, and concluded with dinner. We enjoyed input on the world situation today by this seasoned politician. 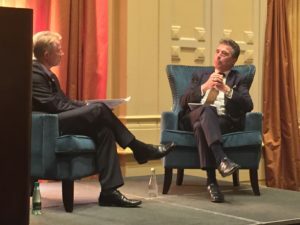 Anders Fogh Rasmussen also shared anecdotes from his interesting life as the highest political representative of Denmark and later NATO. Dorthe Mikkelsen Wright, Honorary Consul of Denmark, and Edward Wright were in attendance, along with several of the firm’s clients. Thank you DACCNCAL for a lovely evening!